Combine the bread crumbs, parmesan, salt, and garlic powder in a small bowl. Whisk the egg in a second bowl and place the flour in a third bowl. Make an assembly line with the bowls. 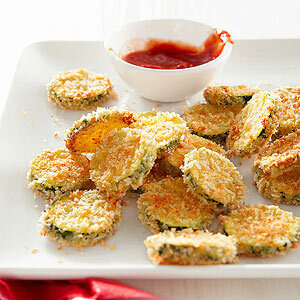 Dip the zucchini circles in the flour, then the egg, and finally the bread crumb mixture coating them evenly. Fry in oil until golden brown, 1-2 minutes. Dry on paper towels. Sprinkle with more salt if desire. Serve warm.